Iron Maiden Returns to North America for 2017 Continuing "The Book of Souls Tour." Iron Maiden's hugely successful The Book Of Souls World Tour returns to North America for an extensive series of arena and amphitheater shows in summer 2017. The mammoth tour opened in Florida last February playing fourteen sold-out shows in the U.S.A and Canada along with a further 58 concerts in 34 other countries around the globe. 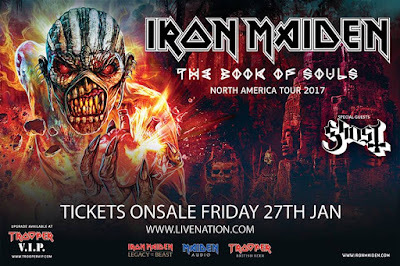 Iron Maiden are delighted to welcome the band Ghost as their Special Guests for the North American leg of The Book Of Souls World Tour. The Book Of Souls is Maiden's first ever double studio album and their most successful chart-wise to date, debuting at the No.1 spot in over 40 countries around the world and No.2 in Canada. View Iron Maiden's with Special Guests Ghost Full Tour Dates for 2017. Despite little radio or television support, Iron Maiden are considered one of the most successful heavy metal bands in history, with The Observer reporting in 2015 that the band have sold over 90 million albums worldwide. The band won the Ivor Novello Award for international achievement in 2002. As of October 2013, the band have played over 2000 live shows throughout their career. For the past 35 years, the band have been supported by their famous mascot, "Eddie," who has appeared on almost all of their album and single covers, as well as in their live shows. From February 2016, the band will embark on The Book of Souls World Tour, which will see them play concerts in 35 countries in North and South America, Asia, Australasia, Africa and Europe, including their first ever performances in China, El Salvador and Lithuania. As with 2008-09's Somewhere Back in Time World Tour and 2010-11's The Final Frontier World Tour, the group will be travelling in a customised aeroplane, flown by Dickinson and nicknamed "Ed Force One", although this time they will be using a Boeing 747-400 jumbo jet. When the name Iron Maiden comes up it's easy to think of "Rime of the Ancient Mariner," "2 Minutes To Midnight," "Run to the Hills," and "the Number of the Beast." These are the Maiden staples - the songs that even non-Maiden freak metal heads know and can sing along to. It's easy to focus on the massive hits that any band or artist may have - Motorhead's "Ace of Spades," KISS' "Rock And Roll All Night," Megadeth's "Peace Sells," but we all know there's much more to a band than their most loved songs - and there's much more good music than the classics by any artist who had stood the test of time. Iron Maiden's From Fear To Eternity - The Best if 1990 - 2010 is a perfect example. Pop in one of the two discs of this release and one is instantly reminded that that the most recent era in Maiden's history has brought some solid rockers to the table as well. From Fear To Eternity - The Best if 1990 - 2010 is a musical time capsule, if you will, a slice of history in one of metal's greatest bands, and a must-have for any metal music collection. Review by Melanie Falina ©2011. "IRON MAIDEN: FLIGHT 666" - A Film All Should Own! Can you handle 45 days on the road on the most adventurous rock tour ever? On April 21, 2009 the award winning Film FLIGHT 666 was screened in more than 450 special digital movie theaters in 42 Countries! Reviews, phenomenal media and fan reaction from private screenings of the first ever full length feature film from Brit award winners IRON MAIDEN have prompted Universal Music Enterprises (UMe) rush release the film and soundtrack for home-viewing enjoyment. FLIGHT 666 released on extended Blu-ray and DVD formats, alongside a double-CD soundtrack album and limited edition double-vinyl picture disc. Filmed digitally in Hi-Def to provide pristine picture quality, FLIGHT 666 was directed by Sam Dunn and Scot McFadyen with the award-winning Banger Productions team ("Metal; A Headbanger's Story" and "Global Metal") who take you right inside the Maiden family with almost total access to the band, something which Maiden have never allowed before. The stunning 5.1 soundtrack was specially mixed by Maiden producer Kevin Shirley to complement the picture quality as an ultimate attack on your senses. FLIGHT 666 documents the first leg of Maiden's legendary SOMEWHERE BACK IN TIME WORLD TOUR which took them 50,000 miles round the planet playing 23 concerts on five continents in just 45 days. One of the stars of the movie is the band's customized Boeing 757, Ed Force One, which carried the band, all their crew and 12 tons of stage equipment and was piloted by Maiden vocalist Bruce Dickinson, a fully qualified and active Airline Captain with Astraeus Airlines. Taking you on a visual global tour from Mumbai to Sydney, Tokyo to L.A., Mexico City to Costa Rica, Bogota to Sao Paulo, Buenos Aires and Santiago to New York and Toronto and places in-between, you travel with the band and crew on the plane, to and from shows, in the bar and during leisure time, while experiencing the exhaustion and fan pandemonium that comes with such as mission. FLIGHT 666 (named after the official airways flight call) reveals how the idea for this unique tour actually came about and how complex planning turned it into a reality. The documentary also contains some of the most spectacular live footage yet seen of the band, filmed in all of those locations and beyond. If you have ever wanted to see the inside story of a truly unique and worldwide tour, taking you to places you never imagined, Maiden fan or not, this is your opportunity. As a very special bonus for the fans, Maiden have included a second disc of the entire set from the 2008 segment of this tour with the DVD (and long-play Blu-ray). Sixteen songs from sixteen different cities in eleven countries around the world, for the first time ever encompassing such varied places and cultures in one concert. (See full track listing below). UMe will release a special souvenir Limited Edition Deluxe DVD with 26-page booklet, after which it will be available as a standard double DVD version. The soundtrack audio version of the live show will be available on a double CD, as a limited edition vinyl set with two picture discs, and a digital download especially for those fans who do not have DVD access or just want to enjoy the show as a great live album. All are lavishly packaged as an ultimate memento of a tour to remember. To recognize the global phenomenon of Maiden, the Blu-ray/DVD are also subtitled in Hindi, Japanese, Dutch, German, Spanish, Brazilian Portuguese, French, Italian, Portuguese and Swedish. Comments band manager Rod Smallwood; "It's been a mammoth undertaking. From the first twinkle in Bruce's eye it's taken about three years to put band, crew and equipment in a giant flying 'splitter bus', to go through all the long and tiresome prep and safety regulations and planning, to the actual filming and of the tour itself, through to post production and right up to putting together all these items in the very best quality possible for our fans." "It's great that with MAIDEN DAY on Tuesday April 21, will can give our fans the opportunity of seeing this digitally on big screen in Hi Def with full-on 5.1 sound experience with other fans around them. It was also very rewarding that it has won the prestigious SXSW Film Festival Award for Best Music Documentary." "The 'Somewhere Back in Time Tour' reached almost 2 million fans in 39 countries and, if there is one thing l know from managing Maiden all these years, it's that our fans are not happy to wait too long, so we are delighted that UMe are rush-releasing the DVD. This closes the chapter on an absolutely brilliant experience delving into the past for the band, myself and my team, the crew and hopefully all of you fans out there. After the summer and some deserved time off, we will concentrate on the 'new' with the band starting to put together material for a brand new studio album due sometime later in 2010. And, of course, after that we will look forward to seeing all our fans again!!"